The first school in Cass Township was at Morgan, three miles east of Wanatah. The first school building in Wanatah was just south of the Salem Church. The second school house, built in 1870, was in the west part of town and was known as Enterprise Hall. It was built by a local stock company and was used as a meeting hall and for church services as well as school classes. The township considered buying it but it burned down in1878, before the decision was made final. It stood at the northwest corner of Washington and Cross Streets and the small house on the corner is built from the bricks from Enterprise Hall. Although it is a brick house it is covered with siding now. After the Hall burned down, school classes were held for the balance of the term in private homes. The third Wanatah School House was built on the northeast corner of Cross and Main Streets. It, however, burned to the ground in 1884. Construction began on a new building immediately. This would be the fifth school building to be built Wanatah. It was to be a brick structure and modern in every way, with the required sanitary and lighting conditions and an assembly hall to seat 700 people. It was decided that a bigger playground was needed and the Christian Church that sat just to the north of the school was purchased and was to be moved off the property. The Christian Church purchased a property one block to the west for $800. A small house on that property had to be moved to the west side of town before the church could be moved to that property. The $2100 the church received from the township for the old property enabled them to put a basement with a furnace under it at the new location. With the church gone, the new brick school house was built on the north part of the property. This also had something to do with a law that stated that a school had to be a certain amount of feet away from a Railroad track. The contract to build the new school was awarded to W. Williams, of Gary for $23,479. Joseph Ameling, of Chesterton, bid $24,268 and Foster Lumber co., of Valparaiso was awarded the sheet metal and tile roofing contract. The heating and ventilating contract was to be let later. Completion of the new school moved along rapidly even though the construction manager, Mr. Williams, died of a heart attack midway into the job. In January of 1915, when classes resumed after the Christmas Vacation the new school was ready. A few things needed to be completed but classes moved into the new building and everything went well. Now that the new building was in use the old frame structure was sold at auction. It was purchased by Miss Josie Engerle for $385. Henry Wolf bought the wood shed for $60. Miss Engerle had the old frame school house torn down and sold the lumber to someone who took it to LaCrosse to be used to build houses. In 1883 the first eighth grade class was graduated. It consisted of 9 pupils. Occasionally some high school subjects were taught, supplementing the common school subjects, but the first high school work at Wanatah under state supervision was offered during the school year of 1893-1894. Clark Bunnell was principal at that time and nine pupils were persuaded to take high school work. Some of these pupils had graduated from the eighth grade under Mr. Bunnell in the spring of 1893 and some had graduated during previous years. A two year course was organized and the first high school commencement was held at the close of school in 1895. That class was composed of four members. The last class under the two-year course graduated in 1900. During the year 1900-1901, the eleventh grade was added. The regular four year course was given for the first time in 1903-1904, so the first graduating class from a four year commissioned high school at Wanatah received their diplomas in the spring of 1904. 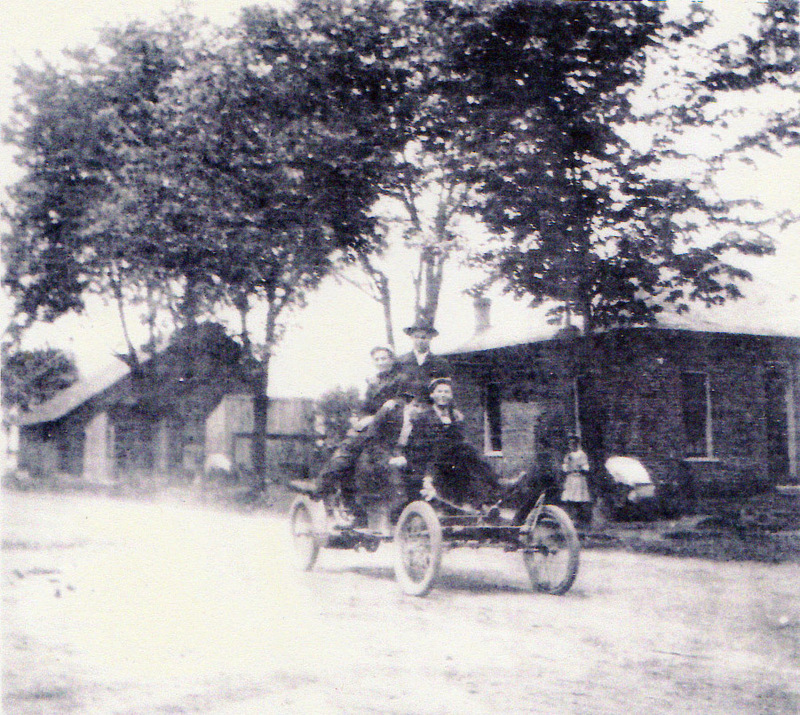 The four happy lads in their car, three of whom we can name are Ed '' Happy'' Grieger and August ''Yankee'' Greiger to the rear and Wm ''Shockey'' Etter to the front. We are unsure of the driver but it may be ''Billie'' Wilson. Notice the driver is steering with a stick. They are going past the house built from the bricks from the Enterprise Hall's basement. The Hall stood on this same site from 1870 to 1878. This Wanatah School House was built in 1885, remodeled in 1901, and was in use until 1914. This was the fourth Wanatah School house and stood where Scarecrow Square is today. It was torn down after the Modern Brick School House was built just to the north of it in 1914. The fifth School House was the last Wanatah School to serve as a High School. This building was built in 1914 to serve all 12 grades of the Wanatah School system. The first floor housed grades one thru six and the second floor housed grades seven thru twelve. A new elementary school opened across town in 1961, and this building continued to serve as the High School and Junior High until the High School was decommissioned in 1969. After that it served as Junior High until 1982 when it was abandoned. It was scheduled to be demolished in 1984, but it was torched by an arson and burned to the ground June 26, 1984. 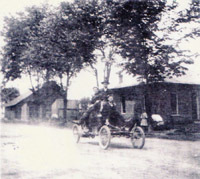 In 1899 in addition to the school in Wanatah, Cass Township had seven one room schools. The schools and their teachers are as follows: Pleasant Grove, Blanch Long; Morgan, Mollie Henning; Center Eva Shurte; South Morgan, Edith Wilson; Thomaston, Marie Fudenski; Creamery, Agnes Sullivan; Sitz, Ernest Scholz. In 1922 these schools were replaced with the Cass Township Consolidated Elementary school known as South Central. It was built at the corner of Country Roads 900 West and 1600 South. It continued in use for twenty years until 1943, when the students began to be bused into town of Wanatah to attend the Wanatah School. The school in Wanatah served all 12 grades. In Clinton Township the schools were: Harris, Alice Slocum; Condon, Adaline Lee; Black Oak; Florence Doolittle; Haskell, Herman Goodman; Weed's Corner, Genevieve Forrester; Clinton, Harriet King; Bigelow, Kate Sullivan. 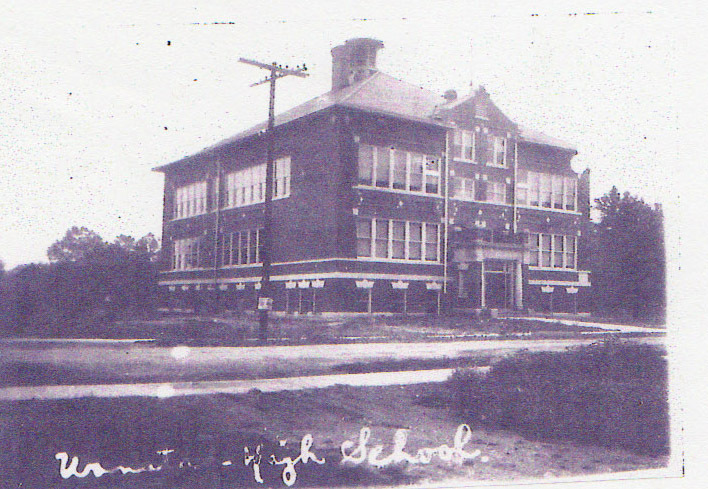 In 1915 Clinton Township built the Clinton Central Consolidated School which included a three year High School. In Morgan Township, Porter County in the school year of 1911-12 nine districts had been reduced to seven. Those seven schools and their teachers were: Adams, Edith Anderson; Rising Sun, Florence Young; Tassinong, Nora McNeff; Bundy, Edith Shroeder; Shroeder, Pearl Stoner; Pinkerton, Olive Donahue; and Flitter, Nora Denton. Morgan Township High School started in 1922 in temporary quarters in Adams Church until a building could be completed. The Morgan Township Consolidated School opened in the fall of 1924. The first school in Morgan Township was a subscription school started in 1834 on the Morgan Prairie in a 12 by 14 foot long cabin. Washington Township in Porter County started with only two schools, but by 1882 there were seven. With the seven schools scattered throughout the 30 square miles of the township, no student had to walk more than three or four miles to their school. The schools in Washington Township were: District 1, Hansford School; District 2, Malone School, District 3, Luther School, District 4, Prattville School; District 5, Bryerly School; District 6, Snake Island School; District 7, Blake School. 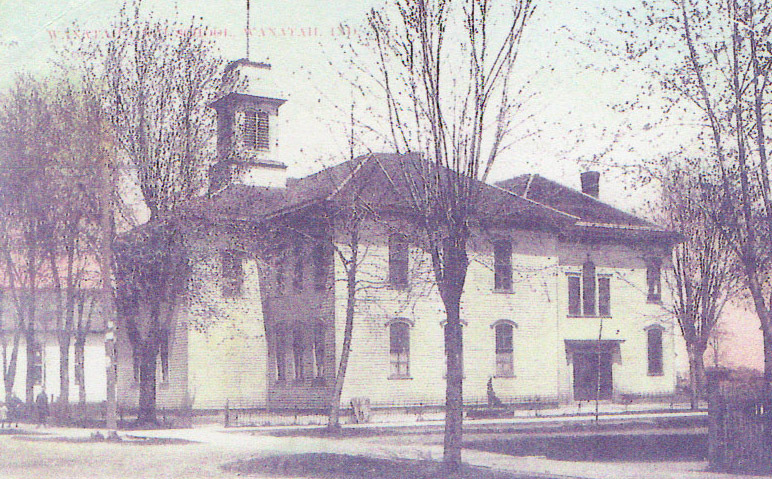 The schools were consolidated in 1911 with a new building built on the site that the Washington Township School stands on today.